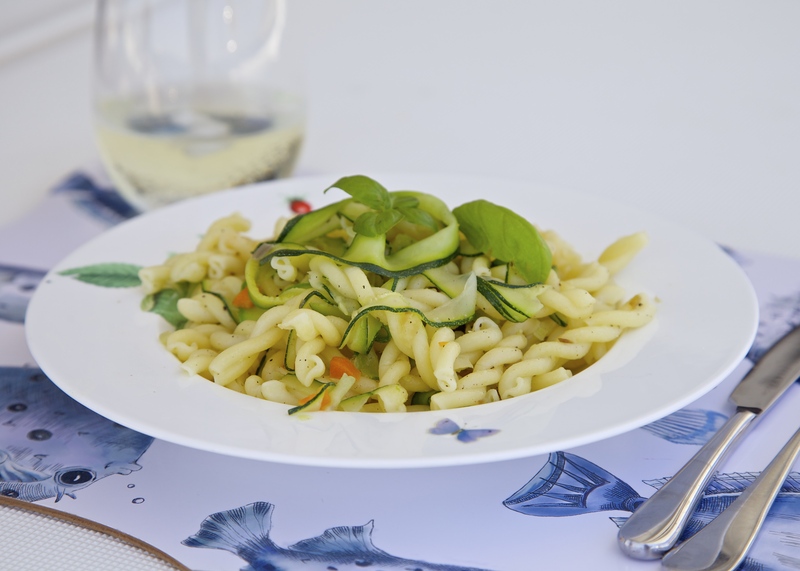 For our vegetarian friends… Zucchini Pasta! I was wondering when you eat out, why pasta topped with one boring vegetable only, can be such an explosion in taste? I did some research and gladly found the answer in the cookbook of a famous restaurant; Gotham in New York. You need to start with a base full of flavour, to boost the taste of the one and only vegetable you are going to use. Easy! I tried it out with zucchini and yes, my guests asked for the recipe! I thought I’d share this one with you too. Boil water for the pasta. Cook the pasta ‘al dente’ following the instructions on the package. Keep a small glass of the starch liquid on the side. Wash the zucchini and celery. Chop the celery, carrot and shallot as fine as possible. With a potato peeler, slice the zucchini lengthwise. (Keep the skin on, that’s where the taste hides!) You should get very thin shavings of zucchini. In a big and deep frying pan (make sure you have a matching lid for later on), heat the olive oil. On a high heat, sauté the onion until translucent. Add the carrot and celery. Stir. Turn the heat to medium and let it simmer for a few minutes with the lid on. Remove the lid. Push the vegetables on one side to make room for the zucchini. Let it cook for 2 minutes with the lid on. Open and stir. Check if the zucchini is tender with the point of a knife. If not, give it an extra minute. As the zucchini is thinly sliced, it won’t need much. If the blend looks too dry, deglaze with a splash of the starch liquid. Add the cooked pasta, pepper and salt. Toss gently. Taste. Add extra pepper and salt to taste. Sprinkle with a tablespoon of extra virgin olive oil or some of the starch liquid, for a lighter dish. Toss. Take away from the heat. Serve in pasta bowls with grated Parmesan. © Magali Schockaert and Gourmetonboard.com, 2015. Unauthorized use and/or duplication of this material without express and written permission from this blog’s author and/or owner is strictly prohibited. Excerpts and links may be used, provided that full and clear credit is given to Magali Schockaert and Gourmetonboard.com with appropriate and specific direction to the original content.